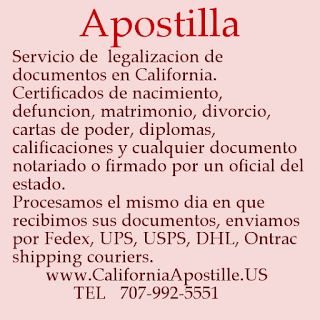 Traveling to Mexico, Apostille, legalization fo documents. 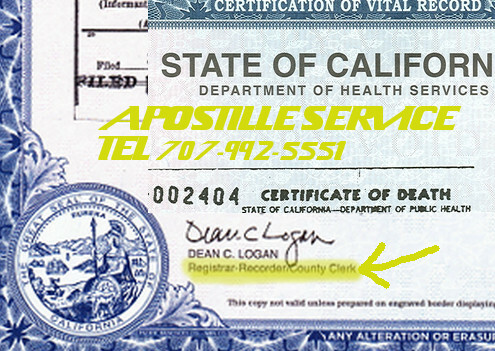 Mexico joined the Hague Apostille Convention on August 14, 1995. (Convention of 5 October 1961 Abolishing the Requirement of Legalization for Foreign Public Documents). 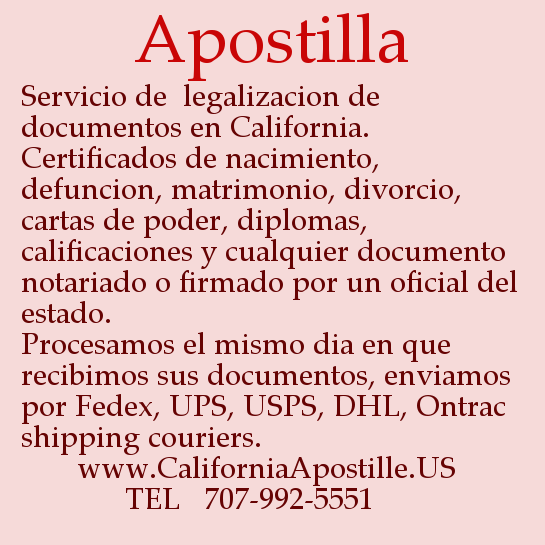 Legal documents being requested by the country of Mexico require certification by the U.S. Government. 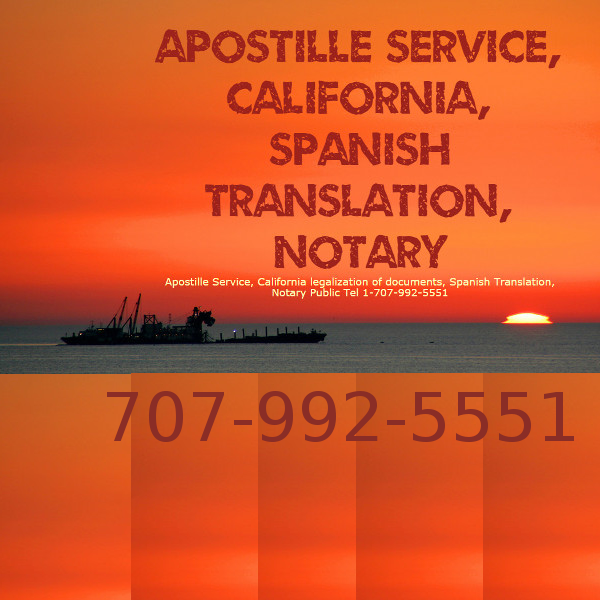 If you also need to translate them from English to Spanish, we start the process as soon as you send us your scanned documents by email. 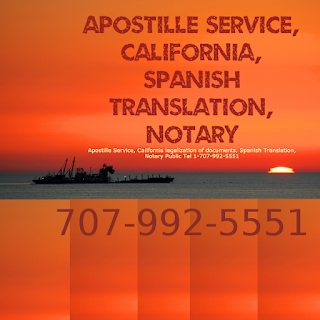 Usually, when we receive your original documents through UPS or FedEx, the translation is ready. 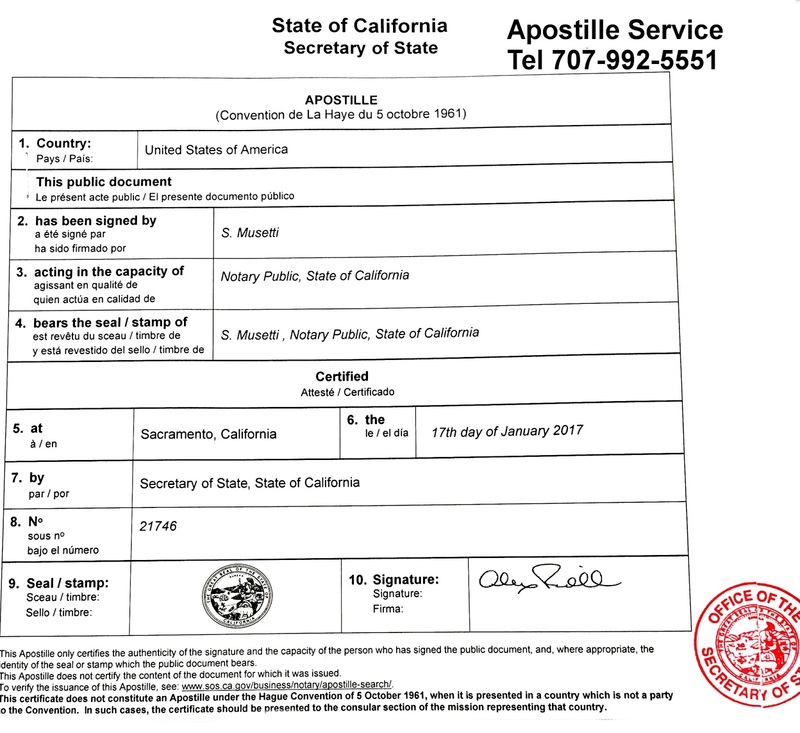 An Apostille certificate has a format. 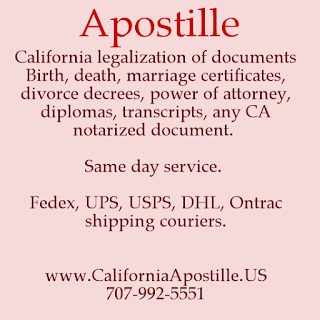 Certificate of Death for Latin American countries and Spain usually need to be translated, certified and notarized before processing the Apostille. 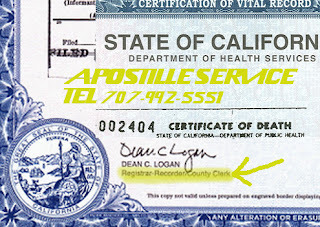 Servicio de Apostilla y traducción certificada y notariada para documentos de California. La legalización y envio de sus documentos se hace el mismo día que recibimos sus documentos. Si usted también necesita traducirlos del ingles al español, empezamos el proceso apenas nos envie por correo electrónico sus documentos. Por lo general, cuando recibimos sus documentos originales a través de UPS o FedEx, la traducción ya esta lista. México se unió a la Convención de la Apostilla de La Haya el 14 de agosto de 1995. (Convenio de 5 de octubre de 1961 que anulo el requisito de legalización de documentos públicos extranjeros). Los documentos legales solicitados por el país de México requieren la certificación del gobierno de EE.UU. Estate Planning, trusts, right of occupancy versus life estate. Many revocable trusts provide that a surviving spouse or another beneficiary has the right to live in a residence rent-free for the remainder of his or her life. This type of provision is particularly common in a second marriage when the person who created the trust (the Trustmaker) comes into the marriage with a home that is separate property and wants the surviving spouse to be able to live there before the property passes to the Trustmaker's children or other heirs. Sometimes this occurs when one adult child caretaker ha lived with the parent in their final years, and the parent wants to allow the adult child to live in the home for a period of years as a "reward" for faithful care. Right of Occupancy: The right to live in a home that does not belong to you is typically referred to as a "life estate," or a "right of occupancy." They are not the same thing. A right of occupancy does not grant the holder any kind of title to the property in question. During any period of occupancy, the title is held by the trustee of the trust. The holder has the exclusive right to occupy the property, although usually subject to certain conditions. 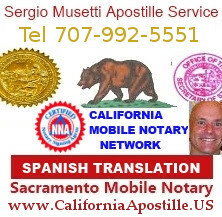 Unless spelled out in the trust document, there are often disputes between the person occupying the property and the remainder beneficiaries about who is responsible for the expenses regarding the property, such as utilities, property taxes, insurance, maintenance, etc. The law is unclear about whether someone with a right of occupancy can bring in other residents, like a new spouse or life partner. Also unclear is whether the Trustee can sell the underlying property and terminate the right to occupancy. 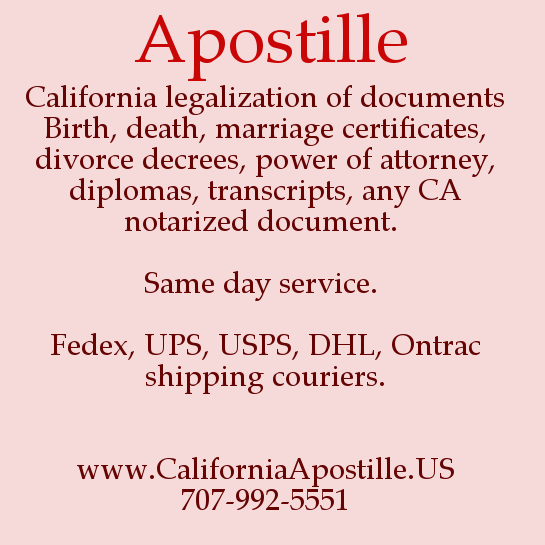 Life Estate: A life estate is transferred through a recorded deed. A life estate tenant, by law, is responsible for upkeep and repairs, mortgage payments, taxes, and other annual charges, unless the trust says otherwise. Estate Taxes: There is also an important tax issue in play. If the right of occupancy is provided in a marital deduction trust of a high-net-worth Trustmaker, and the surviving spouse doesn't provide a full, unfettered right to occupy the residence for life, the settlor's estate could lose the marital deduction on the residential property and be subject to estate taxes. An example of this is when the right of occupancy would terminate if the surviving spouse does not live in the home or allows others to do so. Consult with an experienced estate planning attorney about your estate planning wishes.